Mezzo Spritz infuses cider, sparkling water, and botanicals for a low-calorie alternative to the Aperol Spritz. Aperol Spritz was the go-to cocktail in Philly bars all last summer, and with warmer weather slowly creeping into Philly, a new take on the classic cocktail – dubbed the Mezzo Spritz – could be the perfect sequel. The canned cocktail, made in Chicago, is a departure from the recipe of the Aperol Spritz (which is traditionally prosecco, sparkling water, and Aperol), using cider from Michigan-based Virtue Cider instead and mingling it with sparkling water and botanicals for a blood-orange flavored drink just as fizzy and light as the usual spritz. 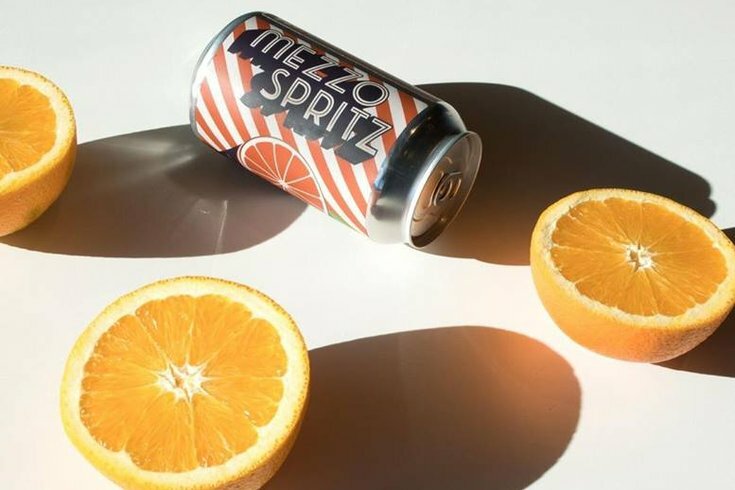 The creators of Mezzo Spritz suggest drinking it out of the can, over ice, or even mixed in another cocktail. The drink officially launched to the public on March 20, available in 12-packs around select distributors in Pennsylvania, New Jersey, and a handful of other states throughout the country. The drink gets its name, Mezzo, from the Italian word for "half." The Mezzo Spritz prides itself on being an 80-calorie alternative and an ABV of just 3.5 percent, half of what you'd find in a typical spritz. Check out the full Mezzo Spritz site for more details.